Information as to his life is scarce, and in some measure inexact. He was born in Proconsular Asia, or at least in some province bordering thereon, in the first half of the second century; the exact date is controverted, between the years 115 and 125, according to some, or, according to others, between 130 and 142. 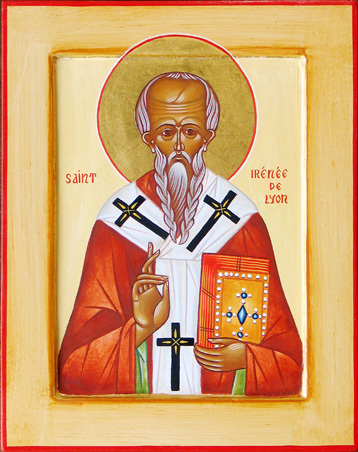 It is certain that, while still very young, Irenaeus had seen and heard the holy Bishop Polycarp (d. 155) at Smyrna. 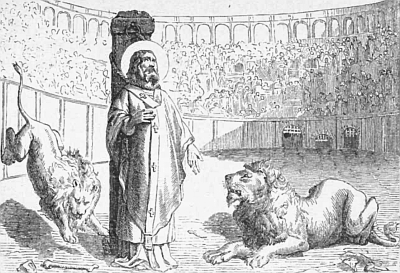 During the persecution of Marcus Aurelius, Irenaeus was a priest of the Church of Lyons. The clergy of that city, many of whom were suffering imprisonment for the Faith, sent him (177 or 178) to Rome with a letter to Pope Eleutherius concerning Montanism, and on that occasion bore emphatic testimony to his merits. Returning to Gaul, Irenaeus succeeded the martyr Saint Pothinus as Bishop of Lyons. During the religious peace which followed the persecution of Marcus Aurelius, the new bishop divided his activities between the duties of a pastor and of a missionary (as to which we have but brief data, late and not very certain) and his writings, almost all of which were directed against Gnosticism, the heresy then spreading in Gaul and elsewhere. In 190 or 191 he interceded with Pope Victor to lift the sentence of excommunication laid by that pontiff upon the Christian communities of Asia Minor which persevered in the practice of the Quartodecimans in regard to the celebration of Easter. Nothing is known of the date of his death, which must have occurred at the end of the second or the beginning of the third century. In spite of some isolated and later testimony to that effect, it is not very probable that he ended his career with martyrdom. 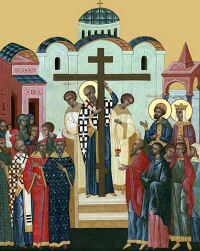 His feast is celebrated on 28 June in the Latin Church, and on 23 August in the Greek. Irenaeus wrote in Greek many works which have secured for him an exceptional place in Christian literature, because in controverted religious questions of capital importance they exhibit the testimony of a contemporary of the heroic age of the Church, of one who had heard St. Polycarp, the disciple of St. John, and who, in a manner, belonged to the Apostolic Age. A treatise in five books, commonly entitled Adversus haereses, and devoted, according to its true title, to the “Detection and Overthrow of the False Knowledge” (see GNOSTICISM, sub-title Refutation of Gnosticism). Of this work we possess a very ancient Latin translation, the scrupulous fidelity of which is beyond doubt. It is the chief work of Irenaeus and truly of the highest importance; it contains a profound exposition not only of Gnosticism under its different forms, but also of the principal heresies which had sprung up in the various Christian communities, and thus constitutes an invaluable source of information on the most ancient ecclesiastical literature from its beginnings to the end of the second century. In refuting the heterodox systems Irenaeus often opposes to them the true doctrine of the Church, and in this way furnishes positive and very early evidence of high importance. Suffice it to mention the passages, so often and so fully commented upon by theologians and polemical writers, concerning the origin of the Gospel according to St. John (see JOHN, GOSPEL OF SAINT), the Holy Eucharist, and the primacy of the Roman Church. St. Gabriel was born in Assisi Italy in 1838 and had great intellectual gifts. As a young man, when by the gift of God’s mercy had already been called to a more perfect life, he fell ill and began to weary of the vanity of this world. Guided by Our Lady, he entered the Passionist congregation and chose the name Gabriel of the Sorrowful Virgin, in order to keep in mind continually both the Joys and Sorrows of the Virgin Mary. 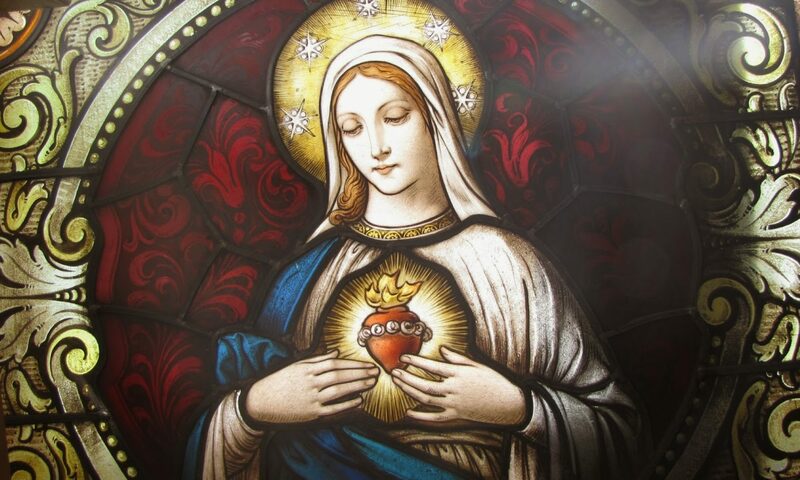 Honoring her in every way, he was accustomed particularly to contemplating here as worn out and afflicted by Jesus’ sufferings, with such sorrow that he shed a flood of tears. He kept his virginity intact and following the strict usage of his congregation, he lived wholly crucified to the world, and for God alone. 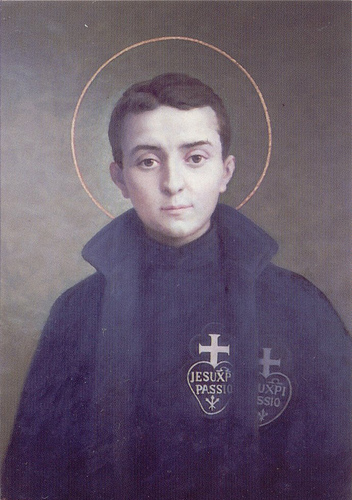 Thus he completed his short life in the exercise of all virtues; consumed by the fire of charity rather than by the force of his illness and refreshed by the aid of God’s Mother, he went to heaven at the age of 24. More than one of the earliest ecclesiastical writers have given credence, though apparently without good reason, to the legend that Ignatius was the child whom the Savior took up in His arms, as described in Mark 9:35. It is also believed, and with great probability, that, with his friend Polycarp, he was among the auditors of the Apostle St. John. 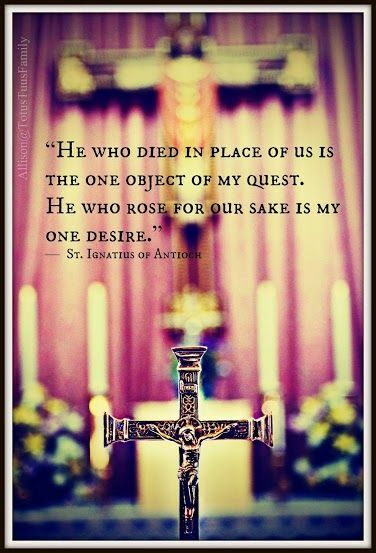 If we include St. Peter, Ignatius was the third Bishop of Antioch and the immediate successor of Evodius (Eusebius, “Hist. Eccl.”, II, iii, 22). Theodoret (“Dial. Immutab.”, I, iv, 33a, Paris, 1642) is the authority for the statement that St. Peter appointed Ignatius to the See of Antioch. 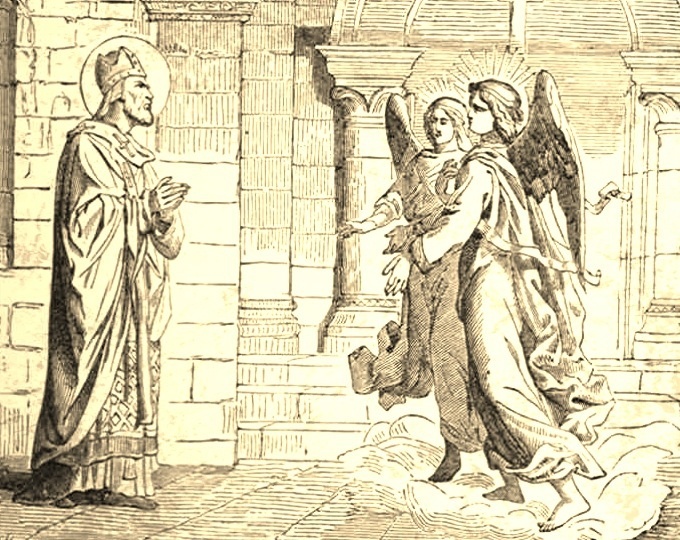 St. John Chrysostom lays special emphasis on the honor conferred upon the martyr in receiving his episcopal consecration at the hands of the Apostles themselves (“Hom. in St. Ig.”, IV. 587). Natalis Alexander quotes Theodoret to the same effect (III, xii, art. xvi, p. 53). All the sterling qualities of ideal pastor and a true soldier of Christ were possessed by the Bishop of Antioch in a preeminent degree. Accordingly, when the storm of the persecution of Domitian broke in its full fury upon the Christians of Syria, it found their faithful leader prepared and watchful. He was unremitting in his vigilance and tireless in his efforts to inspire hope and to strengthen the weaklings of his flock against the terrors of the persecution. The restoration of peace, though it was short-lived, greatly comforted him. But it was not for himself that he rejoiced, as the one great and ever-present wish of his chivalrous soul was that he might receive the fullness of Christian discipleship through the medium of martyrdom. His desire was not to remain long unsatisfied. Associated with the writings of St. Ignatius is a work called “Martyrium Ignatii “, which purports to be an account by eyewitnesses of the martyrdom of St. Ignatius and the acts leading up to it. In this work, which such competent Protestant critics as Pearson and Ussher regard as genuine, the full history of that eventful journey from Syria to Rome is faithfully recorded for the edification of the Church of Antioch. It is certainly very ancient and is reputed to have been written by Philo, deacon of Tarsus, and Rheus Agathopus, a Syrian, who accompanied Ignatius to Rome. It is generally admitted, even by those who regarded it as authentic, that this work has been greatly interpolated. Its most reliable form is that found in the “Martyrium Colbertinum” which closes the mixed recension and is so called because its oldest witness is the tenth-century Codex Colbertinus (Paris). According to these Acts, in the ninth year of his reign, Trajan, flushed with victory over the Scythians and Dacians, sought to perfect the universality of his dominion by a species of religious conquest. He decreed, therefore, that the Christians should unite with their pagan neighbors in the worship of the gods. A general persecution was threatened, and death was named as the penalty for all who refused to offer the prescribed sacrifice. Instantly alert to the danger that threatened, Ignatius availed himself of all the means within his reach to thwart the purpose of the emperor. The success of his zealous efforts did not long remain hidden from the Church’s persecutors. He was soon arrested and led before Trajan, who was then sojourning in Antioch. Accused by the emperor himself of violating the imperial edict, and of inciting others to like transgressions, Ignatius valiantly bore witness to the faith of Christ. If we may believe the account given in the “Martyrium”, his bearing before Trajan was characterized by inspired eloquence, sublime courage, and even a spirit of exultation. Incapable of appreciating the motives that animated him, the emperor ordered him to be put in chains and taken to Rome, there to become the food of wild beasts and a spectacle for the people. That the trials of this journey to Rome were great we gather from his letter to the Romans (par. 5): “From Syria even to Rome I fight with wild beasts, by land and sea, by night and by day, being bound amidst ten leopards, even a company of soldiers, who only grow worse when they are kindly treated.” Despite all this, his journey was a kind of triumph. News of his fate, his destination, and his probable itinerary had gone swiftly before. At several places along the road his fellow-Christians greeted him with words of comfort and reverential homage. It is probable that he embarked on his way to Rome at Seleucia, in Syria, the nearest port to Antioch, for either Tarsus in Cilicia, or Attalia in Pamphylia, and thence, as we gather from his letters, he journeyed overland through Asia Minor. At Laodicea, on the River Lycus, where a choice of routes presented itself, his guards selected the more northerly, which brought the prospective martyr through Philadelphia and Sardis, and finally to Smyrna, where Polycarp, his fellow-disciple in the school of St. John, was bishop. The stay at Smyrna, which was a protracted one, gave the representatives of the various Christian communities in Asia Minor an opportunity of greeting the illustrious prisoner, and offering him the homage of the Churches they represented. From the congregations of Ephesus, Magnesia, and Tralles, deputations came to comfort him. To each of these Christian communities he addressed letters from Smyrna, exhorting them to obedience to their respective bishops, and warning them to avoid the contamination of heresy. These, letters are redolent with the spirit of Christian charity, apostolic zeal, and pastoral solicitude. While still there he wrote also to the Christians of Rome, begging them to do nothing to deprive him of the opportunity of martyrdom. From Smyrna his captors took him to Troas, from which place he dispatched letters to the Christians of Philadelphia and Smyrna, and to Polycarp. Besides these letters, Ignatius had intended to address others to the Christian communities of Asia Minor, inviting them to give public expression to their sympathy with the brethren in Antioch, but the altered plans of his guards, necessitating a hurried departure, from Troas, defeated his purpose, and he was obliged to content himself with delegating this office to his friend Polycarp. At Troas they took ship for Neapolis. From this place their journey led them overland through Macedonia and Illyria. The next port of embarkation was probably Dyrrhachium (Durazzo). Whether having arrived at the shores of the Adriatic, he completed his journey by land or sea, it is impossible to determine. Not long after his arrival in Rome he won his long-coveted crown of martyrdom in the Flavian amphitheater. 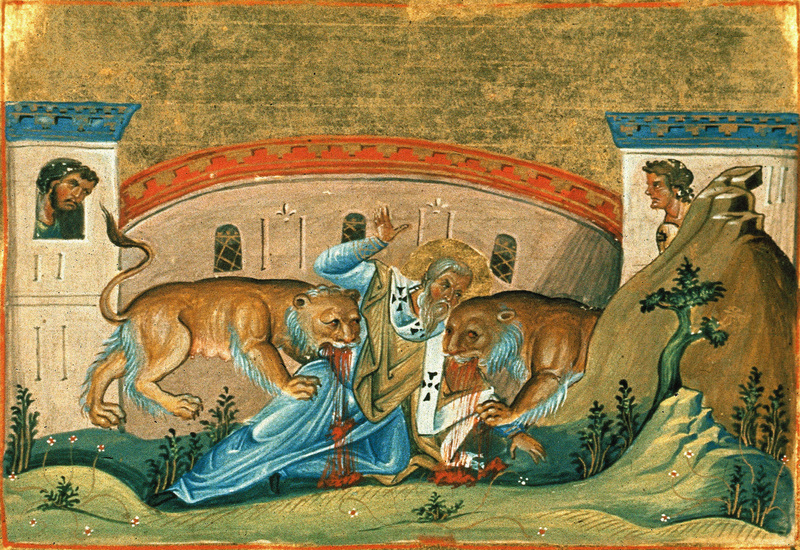 The relics of the holy martyr were borne back to Antioch by the deacon Philo of Cilicia, and Rheus Agathopus, a Syrian, and were interred outside the gates not far from the beautiful suburb of Daphne. They were afterwards removed by the Emperor Theodosius II to the Tychaeum, or Temple of Fortune which was then converted into a Christian church under the patronage of the martyr whose relics it sheltered. In 637 they were translated to St. Clement’s at Rome, where they now rest. The Church celebrates the feast of St. Ignatius on 1 February. It is extremely probable that the interpolation of the genuine, the addition of the spurious letters, and the union of both in the long recension was the work of an Apollonarist of Syria or Egypt, who wrote towards the beginning of the fifth century. Funk identifies him with the compiler of the Apostolic Constitutions, which came out of Syria in the early part of the same century. Subsequently there was added to this collection a panegyric on St. Ignatius entitled, “Laus Heronis”. Though in the original it was probably written in Greek, it is now extant only in Latin and Coptic texts. There is also a third recension, designated by Funk as the “mixed collection”. The time of its origin can be only vaguely determined as being between that of the collection known to Eusebius and the long recension. Besides the seven genuine letters of Ignatius in their original form, it also contains the six spurious ones, with the exception of that to the Philippians. In this collection is also to be found the “Martyrium Colbertinum”. The Greek original of this recension is contained in a single codex, the famous Mediceo-Laurentianus manuscript at Florence. This codex is incomplete, wanting the letter to the Romans, which, however, is to be found associated with the “Martyrium Colbertinum” in the Codex Colbertinus, at Paris. The mixed collection is regarded as the most reliable of all in determining what was the authentic text of the genuine Ignatian letters. There is also an ancient Latin version which is an unusually exact rendering of the Greek. Critics are generally inclined to look upon this version as a translation of some Greek manuscript of the same type as that of the Medicean Codex. This version owes its discovery to Archbishop Ussher, of Ireland, who found it in two manuscripts in English libraries and published it in 1644. It was the work of Robert Grosseteste, a Franciscan friar and Bishop of Lincoln (c. 1250). The original Syriac version has come down to us in its entirety only in an Armenian translation. It also contains the seven genuine and six spurious letters. This collection in the original Syriac would be invaluable in determining the exact text of Ignatius, were it in existence, for the reason that it could not have been later than the fourth or fifth century. The deficiencies of the Armenian version are in part supplied by the abridged recension in the original Syriac. This abridgment contains the three genuine letters to the Ephesians, the Romans, and to Polycarp. The manuscript was discovered by Cureton in a collection of Syriac manuscripts obtained m 1843 from the monastery of St. Mary Deipara in the Desert of Nitria. Also there are three letters extant only in Latin. Two of the three purport to be from Ignatius to St. John the Apostle, and one to the Blessed Virgin, with her reply to the same. These are probably of Western origin, dating no further back than the twelfth century. At intervals during the last several centuries a warm controversy has been carried on by patrologists concerning the authenticity of the Ignatian letters. Each particular recension has had its apologists and its opponents. Each has been favored to the exclusion of all the others, and all, in turn, have been collectively rejecte d, especially by the coreligionists of Calvin. The reformer himself, in language as violent as it is uncritical (Institutes, 1-3), repudiates in globo the letters which so completely discredit his own peculiar views on ecclesiastical government. The convincing evidence which the letters bear to the Divine origin of Catholic doctrine is not conducive to predisposing non-Catholic critics in their favor, in fact, it has added not a little to the heat of the controversy. In general, Catholic and Anglican scholars are ranged on the side of the letters written to the Ephesians, Magnesians, Trallians, Romans, Philadelphi ans, Smyrniots, and to Polycarp; whilst Presbyterians, as a rule, and perhaps a priori, repudiate everything claiming Ignatian authorship. The two letters to the Apostle St. John and the one to the Blessed Virgin, which exist only in Latin, are unanimously admitted to be spurious. The great body of critics who acknowledge the authenticity of the Ignatian letters restrict their approval to those mentioned by Eusebius and St. Jerome. The six others are not defended by any of the early Fathers. The majority of those who acknowledge the Ignatian authorship of the seven letters do so conditionally, rejecting what they consider the obvious interpolations in these letters. In 1623, whilst the controversy was at its height, Vedelius gave expression to this latter opinion by publishing at Geneva an edition of the Ignatian letters in which the seven genuine letters are set apart from the five spurious. In the genuine letters he indicated what was regarded as interpolations. The reformer Dallaeus, at Geneva, in 1666, published a work entitled “De scriptis quae sub Dionysii Areop. 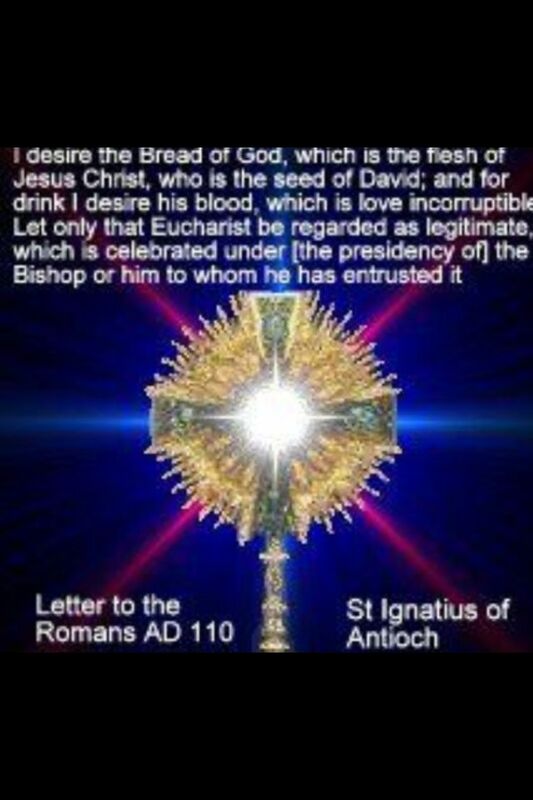 et Ignatii Antioch. nominibus circumferuntur”, in which (lib. II) he called into question the authenticity of all seven letters. To this the Anglican Pearson replied spiritedly in a work called “Vindiciae epistolarum S. Ignatii”, published at Cambridge, 1672. So convincing were the arguments adduced in this scholarly work that for two hundred years the controversy remained closed in favor of the genuineness of the seven letters. The discussion was reopened by Cureton’s discovery (1843) of the abridged Syriac version, containing the letters of Ignatius to the Ephesians, Romans, and to Polycarp. In a work entitled “Vindiciae Ignatianae” London, 1846), he defended the position that only the letters contained in his abridged Syriac recension, and in the form therein contained, were genuine, and that all others were interpolated or forged outright. This position was vigorously combated by several British and German critics, including the Catholics Denzinger and Hefele, who successfully de fended the genuineness of the entire seven epistles. It is now generally admitted that Cureton’s Syriac version is only an abbreviation of the original. While it can hardly be said that there is at present any unanimous agreement on the subject, the best modern criticism favors the authenticity of the seven letters mentioned by Eusebius. Even such eminent non-Catholic critics as Zahn, Lightfoot, and Harnack hold this view. Perhaps the best evidence of their authenticity is to be found in the letter of Polycarp to the Philippians, which mentions each of them by name. As an intimate friend of Ignatius, Polycarp, writing shortly after the martyr’s death, bears contemporaneous witness to the authenticity of these letters, unless, indeed, that of Polycarp itself be regarded as interpolated or forged. When, furthermore, we take into consideration the passage of Irenaeus (Adv. Haer., V, xxviii, 4) found in the original Greek in Eusebius (Hist. eccI., III, xxxvi), in which he refers to the letter to the Romans. (iv, I) in the following words: “Just as one of our brethren said, condemned to the wild beasts in martyrdom for his faith”, the evidence of authenticity becomes compelling. The romance of Lucian of Samosata, “De morte peregrini”, written in 167, bears incontestable evidence that the writer was not only familiar with the Ignatian letters, but even made use of them. Harnack, who was not always so minded, describes these proofs as “testimony as strong to the genuineness of the epistles as any that can be conceived of” (Expositor, ser. 3, III, p. 11).